In the battle against cancer, which kills nearly 8 million people worldwide each year, doctors have in their arsenal many powerful weapons, including various forms of chemotherapy and radiation. What they lack, however, is good reconnaissance—a reliable way to obtain real-time data about how well a particular therapy is working for any given patient. Magnetic resonance imaging and other scanning technologies can indicate the size of a tumor, while the most detailed information about how well a treatment is working comes from pathologists’ examinations of tissue taken in biopsies. Yet these methods offer only snapshots of tumor response, and the invasive nature of biopsies makes them a risky procedure that clinicians try to minimize. 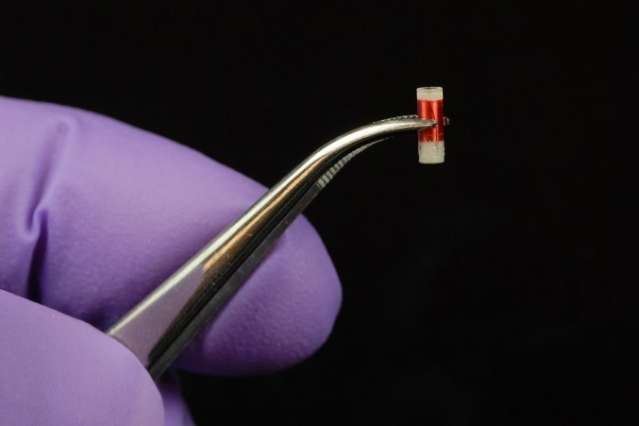 Now, researchers at MIT’s Koch Institute for Integrative Cancer Research are closing that information gap by developing a tiny biochemical sensor that can be implanted in cancerous tissue during the initial biopsy. The sensor then wirelessly sends data about telltale biomarkers to an external « reader » device, allowing doctors to better monitor a patient’s progress and adjust dosages or switch therapies accordingly. Making cancer treatments more targeted and precise would boost their efficacy while reducing patients’ exposure to serious side effects. Two MIT doctoral students in Cima’s lab worked with him on the sensor project: Vincent Liu, now a postdoc at MIT, and Christophoros Vassiliou, now a postdoc at the University of California at Berkeley. Their research is featured in a paper in the journal Lab on a Chip that has been published online. The sensors developed by Cima’s team provide real-time, on-demand data concerning two biomarkers linked to a tumor’s response to treatment: pH and dissolved oxygen. As Cima explains, when cancerous tissue is under assault from chemotherapy agents, it becomes more acidic. « Many times, you can see the response chemically before you see a tumor actually shrink, » Cima says. In fact, some therapies will trigger an immune system reaction, and the inflammation will make the tumor appear to be growing, even while the therapy is effective.